This one is very sloppy structure-wise, but I’m living this thirties fantasy right now and I really felt like writing some stuff related to that, not sure why. But it makes me really happy! The entire poem has references to Al Bowlly. I know the last poem and this one are a bit weird and off-tracks for me. Do not be alarmed, I’m tinkering with new sound constructions for “ofuscus“, the sister structure to “excelse“, but since I’m just starting, it’s mostly an exploration of how variant I can make them sound without sacrificing much of both. These are mostly free-hand practices that allow me to gage and compare. Line 12 is a reference to the book of the same name, “Heights of Despair”, by Emil Cioran. Highly advise you to seek it if you enjoy some grim phylosophy. Line 1 is a reference to a song, all my compositions have at least one of these, sometimes more. In this case, it is “Odd Look” by french musician Kavinsky. Line 17 might look a bit weird, Child is the symbol, while intrumental pain is the syntax. This is done purposefully, but the Child himself won’t appear just here, that’s why I symbolized it by means of capitalization. Its sort of a character but also a projection. A bit of a poetic mesh of common denominators, but a heart-felt one nonetheless. A little back, I wrote this highly experimental (and primal) composition called MIRROR, in which two subconscious voices would be displayed continuously until they would collapse together and generate this sense of unifying thoughts. That poem spawned from my fiddling with the concept of multiple voices in poetry. All my compositions are made to be both read and spoken, therefor, all kinds of sound generation are within the bounds of my poetry. I spent some time wondering about the possibility of poems meant to be read by separate voices, which can be applied to a variety of unique poetic concepts, as well as compounding lyricism with that expression and generate a form of artistic elation of poetry upon dialogue, both internal and external. MIRROR is not a good example, since its very primitive and faulty in the groundworks of what this exercise proposes. For the ease of division in structural compositions, I will name the first voice “Archeon” and the second voice “Bareon”, A and B for short (I’m not a smart guy). Any number of voices can be used, but in my experiments, more than two can become volatile and overbearing. b. buoying docked at a sea of souls, dim and then… lightless. a. eyes shut, where is the flame once consuming and bright? b. not longer here, just ash, in the shade of innocent white. You might be thinking: well, most of these could be composed with a singular voice. Yes, but their poetic momentum rests on the understanding that two separate voices are communicating an unifying symbol, so that symbol is passed through a lens of duality and then translated back into singularity. In the case of repetition, giving a sensation of weight applied to certain parts of the conclusion. 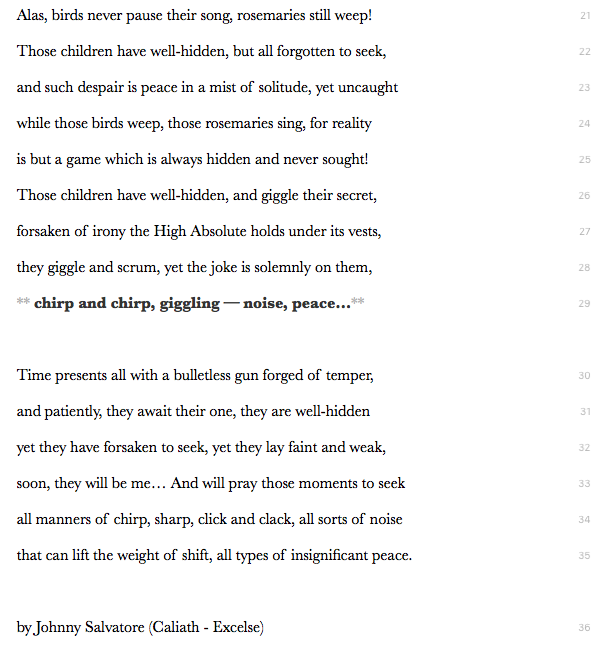 On the example, words like “locked/docked” and “reckless/lightless” double their weight, by means of stressing their permanence, and allowing their scope to encompass more than just the poetic subject, as in, a descent into a lightless reality tangible by all, inspiring the severity of ones perspective. In the case of interrogation – the most useful of all – we can halve the stressing of the question and place it upon the answer. That bright flame once respiring consumingly? It is no more, now it has fully devoured, it is ash in its innocent form, fertile and renewing, but still a painful memory. Interrogation allows for the continuity of the poetic narrative, by means of easing the transmission of what is truly meant to be retained and what isn’t supposed to be front-line in the skeleton of the given composition. Exposition is rather simple, and I would take mostly as a structural aid more than a duality in transmission. It is meant for internal dialogue, and it was the mechanism utilised on MIRROR. It allows for thoughts to unify in two different fronts, giving a sensation of duality when there doesn’t necessarily exist one, often times its just a case of division. Since verses seem to flow into their counterpart voices, it would be a bit too eerie to read it using two separate whole voices, but two separate tones can be utilised rather well. (more on that another day, I’m also producing another Lab with the usage of classical music tempos in poetry, i.e Alegro, Moderato, so on). I’ve been putting off the publishing of this Lab for a while, attempting to etch decent poems that could ally to this minimal theory, but my time has been very scarce and I haven’t been able to compose anything wholesome enough for presentation. I will, therefor, leave you with MIRROR, so you have a general idea of what exposition looks like, and then create the other two during the week, and hopefully publish them as separate posts connecting to this one. I’m sorry for the apparent laziness, but I promise that I will deliver! Not an actual good poem, but hey, its old. Y’all, I’ve been reading too much American poetry, so I’m going through this mixed phase of modernism and romanticism, I hope something good comes out of this because its certainly weird for me to write like this. Disclaimer: bulletless doesn’t seem to be a real word, but I don’t get why, so I’m gonna use it anyway. Disclaimer 2: I’ve since revised the second part of the poem, so if you’re reading for a second time, you may find it different than the original. If you seek the original, you can find it here.